A woman has been robbed by a group of teenagers in a “horrible ordeal”. The 39-year-old victim was robbed of her purse and phone by a group of boys in Morecambe, at about 3.30pm on Friday. Police said she was approached by between 10 and 15 people, thought to be teenagers, as she walked down an alleyway in the area of Brunswick Road. She was then assaulted, suffering bruising and scratches, before the group took her phone, purse and medication. The group, described as aged between 15 and 17 and all wearing face coverings, made off from the scene. Following the incident, two members of the public helped the victim and were able to take her home. DC Trevor Walker, of Lancaster CID, said: “The victim was left very shaken by what was a horrible ordeal. 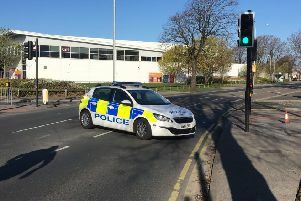 “We would now like to hear from anyone with information about this incident, whether they encountered the group in the area, saw the attack or have information about who the offenders may be. Anyone with information should contact police on 101, quoting crime reference WB1606104.